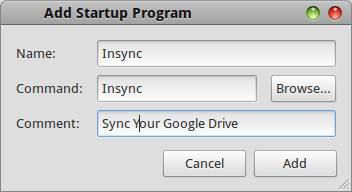 Insync provides a new way to Synchronizing and managing your Document (Doc, Xls, ppt, etc) on Google Drive. This Apps is available in Windows and Mac, and now insync for linux available in beta 3 (0.9.18), Insync for Linux also comes with Nautilus integration, Ubuntu AppIndicator support that displays recent changes, errors and the sync status and support for multiple accounts. Launch Insync from unity dash by typing “insync”. 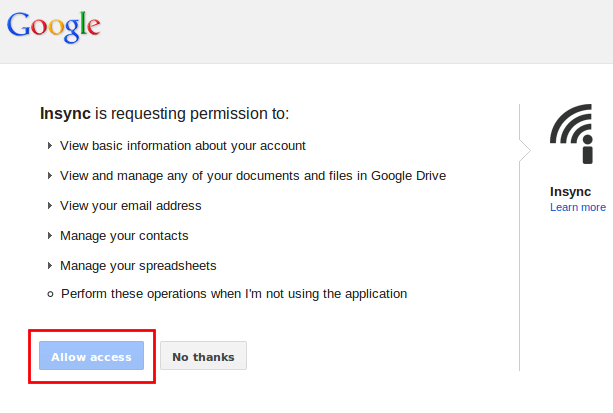 On the first run, it will bring you to the Google site and ask for permission to access your account. You will have to approve it before you can proceed. After allow the permission, now link your machine to your account. Just give it a name and click “Link Machine to this account”. then, Launch Nautilus File Manager and you should see the Insync folder in your Home folder. Insync allow you add multiple Google accounts and they will be synced to their respective folders within the Insync folder on home folder. in additional, Insync also integrated well with the Nautilus. You can right-click any file and select the appropriate actions (such as Open in Google Drive, Share, Get Public Links ) under the Insync Context option.